'R Garden Veggies: The Canning Has Started! Sunday we boiled and slipped the skins off beets. 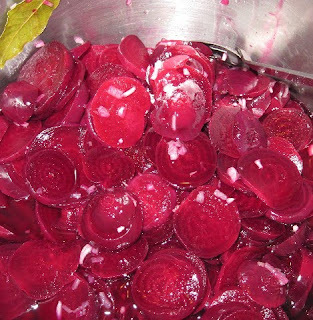 I always liked this part, you just gently squeeze the beets and the skins slip right off. We also washed and took the tops off strawberries, then ran them through the food mill. The mill removes a lot of the small seeds, not all but most. The beets we put in the fridge and the strawberry juice was frozen in gallon bags. Tuesday I cut beets and pickled them. You can get beet juice in places you didn't know you had in the kitchen. 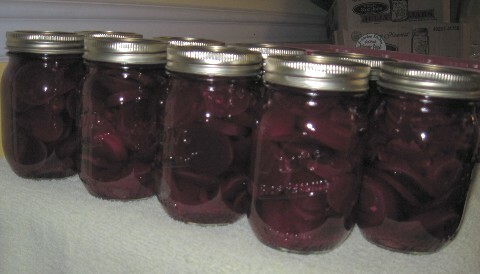 Managed to get one good batch of beets done. 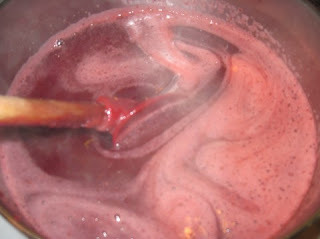 Then on to my first try at making strawberry jam. Looked good, smelled good, tasted good but all I got was syrup. Back to the internet and my books to see where I went wrong. Hopefully I can work it out!! Beautiful beets waiting to boil and go in jars. Not the best picture, i'll try again next batch. It was off to a great start but just got syrup.